The part about the Falcon really hit me for some reason. Maybe it’s because we’ve been watching all the movies in Beemsville, slowly rolling them out for the kids in episodic order. Watching them get all excited about Star Wars, listening to my son wax philosophical about the finer points of Star Destroyer technology, or my daughter’s drawings fusing fairies with Jedi… They are excited. 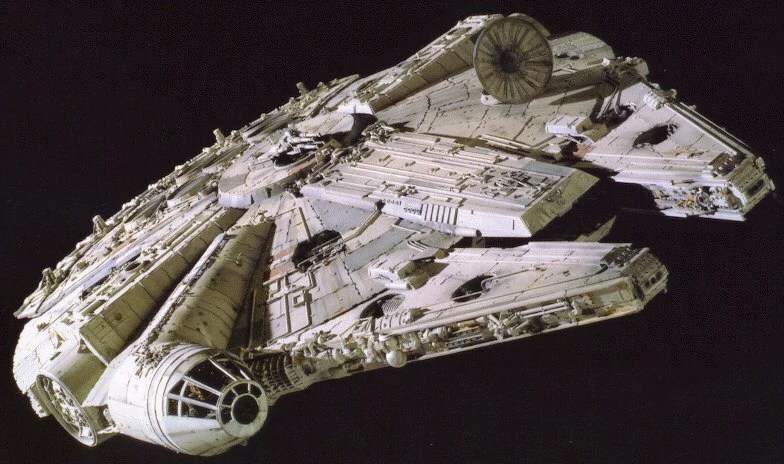 That’s what I remember when I saw the Falcon on the big screen or heard the hiss-hum of a lightsaber igniting. Star Wars. Yes, I’m a fan. Not an obsessive, obnoxious fanboy. Not someone who can’t see the flaws or critical failings of certain aspects of various media and, er, films… But I am someone who’s read my share of tie-in novels, and comics, played the video games, reveled in the Robot Chicken and Family Guy episodes. I’ve even tracked down and watched the Star Wars Holiday Special. As an adult. Sober. 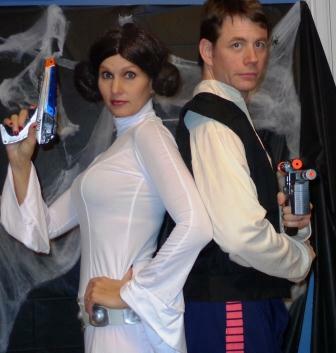 The photo you don’t see here (because I don’t put the kids’ photos on the blog) features the two of them along with us in their jedi gear to, you know, complete the theme. Despite this, I haven’t pushed the movies or even the Clone Wars show on the kids. In fact, I haven’t let them watch the movies all the way through yet because I wanted them to be old enough to appreciate it (and hopefully realize that Jar Jar ain’t cool). Kids love Jar Jar, though. Lucas wasn’t wrong about that. I’m also torn on the whole question of sequencing. Do you start with the original or do you go in Episodic order? Seriously, this is an important decision. See here for more wisdom on this. So the wife goes sale-ing most Saturdays when the weather gets nicer, on the lookout for deals and such. Yesterday at such a sale she spotted some Star Wars stuff. Of course that was an afterthought. She was mainly looking for a bike for our son and stopped to see what was available. OK, I’m thinking. So we made the stop on the way to the morning soccer game. The bike was decent and the right size for the boy’s next step up this summer. 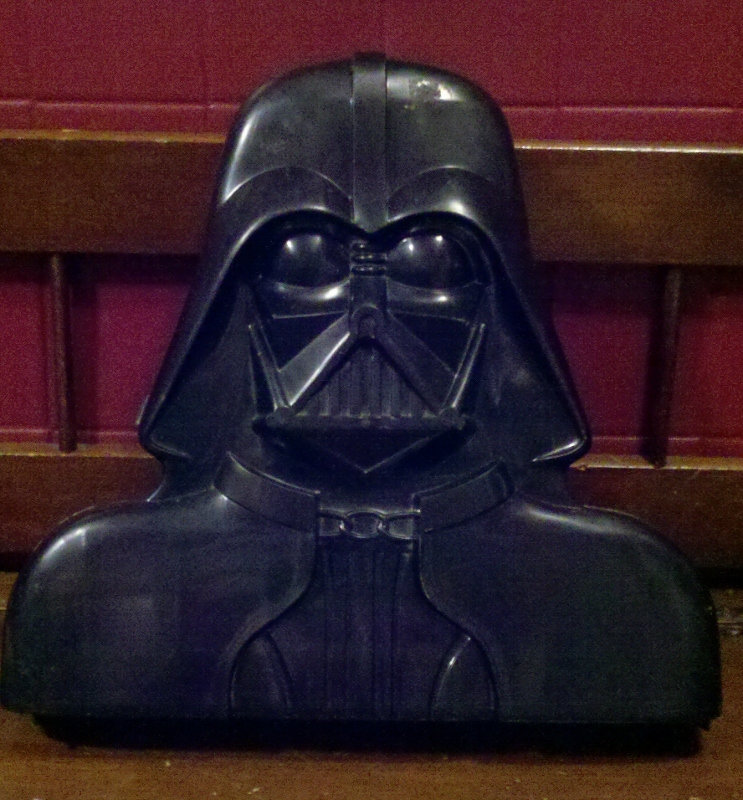 But what immediately caught my eye was the original Darth Vader carrying case. Circa Empire if I’m not mistaken, but could be from the original. The handle was broken off and it looked a little worn, but I was excited. And when I opened said carrying case, what should I find?